The 68-year-old star admitted he was "very proud" to be back at the top of the charts for the first time in 34 years with new album Time. Speaking at a rehearsal studio in west London, Rod said the secret of the record's success was that it drew on his long experience of life. "I've lived a wonderful life and when I was putting the book together it inspired many of the songs. If there's anything that God gave, and some people may disagree, he gave me a tremendous vehicle in my voice. It's just very unique, so I was just lucky to be given this voice." 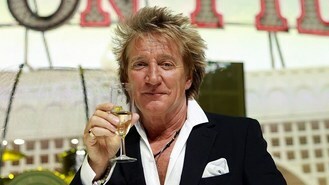 Rod's last number one came with Greatest Hits Vol.1 back in 1979, but his last studio album to top the charts was A Night On The Town in 1976. Known for his rock'n'roll lifestyle and glamorous wives, he first made it to the pinnacle of the album charts in 1971 with Every Picture Tells A Story and scored his last number one before today with single Baby Jane in 1983. Time features 12 new songs, 11 of which he wrote himself, and is also produced by the avid Celtic fan. Twice inducted into the Rock and Roll Hall of Fame, he has sold an estimated 150 million records worldwide since his music career started in the early 1960s. He was made CBE in 2007, released a bestselling autobiography last year and will embark on on a global tour next month. Asked what keeps him going after achieving so much, he said: "The music business and my children - I've got lots of kids, I still play football and I don't smoke which is a very important thing."